When many think of Belgian brewing, images of monks and monasteries often come to mind. The monastic tradition of brewing beer goes back many centuries. St. Benedict (480-547 AD) started the modern monastic movement and his rule, "Live from the work of your hands," is a foundation principle of all monasteries. Hard work and self-sufficiency are the rule and products produced (including beer) are used to fund the monastery's works. How did religious orders get into making beer? Back in the middle ages, pilgrims, crusaders and well-heeled travelers dared not stay in taverns or roadhouses, where the clientele could be pretty rough. These travelers stayed instead in monasteries, which were charged with providing food, drink and shelter. It was a logical next step for many of these brewing monasteries to make and sell beer in their local communities, and religious orders soon became a force in beer production. In those days, before bacteria and sanitation were understood, water was a constant source of infection and disease. Beer - because it was boiled and contained alcohol - was a much safer alternative and was consumed by adults and children alike. Many of these beer-producing monasteries are still around today and are still producing world-cvlass beers. The designations "Trappist" and "Abbey" have very different meanings and are often confused. A Trappist beer is made by actual monks in a working monastery. Abbey beers are not made by monks, although they are often made in defunct abbeys or churches. These abbeys license their names to commercial breweries who produce beers on their behalf. In some cases, Abbey beers are named after fictitious abbeys or local saints. While Abbey beers are often very similar in style to those of Trappist breweries, they cannot carry the "Trappist" designation. The Trappist breweries have established a family of beer styles, which are brewed by Abbey breweries as well. Not every brewery produces every style but has a slate of two or three to half a dozen offerings. Most Trappist and Abbey beers fall into one of the following styles. Single or Enkel beers are low-alcohol beers - often from second runnings - that are intended to be consumed with meals at the monastery. They are often not available commercially. Belgian Blond beers are golden beers that were developed fairly recently to appeal to pils drinkers. They are typically in the 6.0 to 7.5% ABV range with a subtle Belgian complexity, slightly sweet flavor, dry finish and an almost lager-like character. Leffe Blond, Troubadour and Affligem Blond are typical examples of this style. Belgian Dubbels are similar in strength to Blonds - 6.0-7.5% ABV - but are deep reddish-brown, malty and complex. They are variations on monastery beers that date back hundreds of years. Belgian yeast strains provide alcohol, esters and phenolics, while caramelized sugar syrups contribute rum and dried fruit flavors and a dry finish. Westmalle Dubbel is the definitive example of the style, along with Chimay Premiere (Red Label), Corsendonk Abbey Brown Ale, Grimbergen Dubbel and St. Feuilllien Brune. 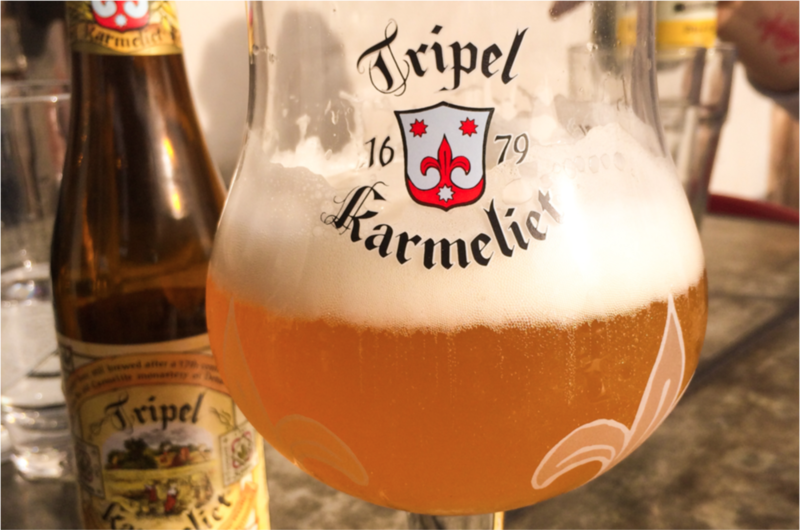 Belgian Tripels are another fairly recent style designed to go after the pilsner market. Tripels can be quite strong (7.5 to 9.5% ABV or more) with fruity esters, spicy phenolics and higher alcohols. They are complex with high carbonation and a dry finish. Westmalle Tripel was the original, but the style is popular with many Trappist and Abbey breweries. Other notable examples include Tripel Karmeliet, St, Bernardus Tripel, Chimay Cinq Cents (White label) and La Rulles Tripel. Belgian Strong Golden ales are similar to tripels, but are even paler, lighter-bodied and crisper with a dry finish. They are spicy and assertively hopped but still complex and delicate - another beer style developed after WW-II to compete with pilsners. Duvel was the original beer of this style and others pay homage to Duvel ("devil" in Flemish, due to its strength and how it sneaks up on you) with devilish, pirate or mischievous names. Besides Duvel, examples of the style include Piraat, Lucifer, Judas, Delirium Tremens and Brigand. Dark Strong ales or Quadrupels are dark, rich, strong and complex beers that are among the finest examples of the Belgian brewing art. A variety of malts and dark caramelized sugar syrups contribute to complexity and Belgian yeast strains add esters, phenolics and higher alcohols. The terms Dark Strong and Quadrupel are somewhat interchangeable. Dark Strongs are typically 8.0 to 11.0% ABV. Quads may be a little more alcoholic at up to 12%. Commercial examples include Westvleteren 12, Rochefort 10, La Trappe Quadrupel, Chimay Grande Reserve (Blue label), St. Bernardus Abt 12, Gulden Draak and Gouden Carolus Grand Cru of the Emperor. Christmas and other specialty beers are brewed by many Belgian brewers, including many Trappist and Abbey breweries. These are often similar to standard offerings, but may be a little higher in alcohol (a thank you to their patrons) and may include special ingredients or spices. One standout Trappist that is like no other is Orval. Orange-gold and of moderate strength, it features spicy hops (some dry-hopped), a unique Belgian yeast strain and a touch of Brettanomyces for a citrusy tartness. In the coming weeks, we will explore Trappist and Abbey beers in more detail, including tasting notes on the various styles within the overall categories.